Renegade Editor’s Note: Truman, the 33rd president, was a 33rd degree Judeo-Christian Freemason. Among all of the past presidents, there’s good transparency about the inner workings and thoughts of No. 33 (1945-1953), Harry S. Truman (1884-1972). One source of insight was his daughter, Margaret Truman Daniel (1924-2008), who wrote his biography published shortly before his death. In his 1997 book “Truman and the Founding of Israel,” Michael Benson indicated that the president was a typical American evangelical wingnut. As such, he was sucked into the idea of Israel as an outgrowth of his religious upbringing and his familiarity with the Bible. As a U.S. senator from Missouri (1935-1945), he had been a member of the American Palestine Committee, a Christian Zionist group and even lent his name to the Committee for a Jewish Army. Truman the man tended to show sympathy to underdogs, which in 1945 he felt applied to Europe’s displaced Jews. However, as the Zionists got the upper hand in Palestine and began to steamroll Palestinians, Truman had second thoughts. At that time, the State Department had a cadre that wanted friendly relations with Arabs. There are numerous documents that correctly predicted permanent crisis and disruption, if Israel was to be established as a Jewish state. In particular, Secretary of State George Marshall and Secretary of Defense James Forrestal worked not only against the idea of an Israeli state, but also to counter the migration of Jews from Europe to Palestine. Truman was subjected to intense Zionist lobbying. A senior member of the State Department described a 1946 visit to New York when a group of Jews called upon Truman. [Alan Taylor, op. cit. p.93] “Emmanuel Cellar was the head of this committee. Rabbi Steven Wise and several others were in it. They called upon Mr. Truman and said, ‘We have just been talking with Mr. Thomas Dewey. He is willing to come out and declare for a Jewish state, and we are going to turn our money and urge the Jews to vote for him unless you beat him to it.’ Then Emmanuel Cellar pounded upon Mr. Truman’s desk and said, ‘And if you don’t come out for a Jewish state we’ll run you out of town.’ This, I’m sure, is the threat that Mr. Truman refers to in his book, saying, ‘The extreme Zionists threatened me.’ Emmanuel Cellar, Rabbi Steven Wise were not the extreme Zionists, they were the run of the mill Zionists. “The Diaries of Truman” later revealed his thoughts on dealing with Jews. “The Jews, I find, are very, very selfish,” Truman wrote in July 1947, 10 months before David Ben-Gurion declared Israel’s independence. “They care not how many Estonians, Latvians, Finns, Poles, Yugoslavs or Greeks get murdered or mistreated as D[isplaced] P[ersons] as long as the Jews get special treatment.” He continued: “When they have power, physical, financial or political neither Hitler nor Stalin has anything on them for cruelty or mistreatment to the underdog. Truman wrote. “The Jews have no sense of proportion nor do they have any judgement on world affairs. By 1947, there were problems in Europe with the Semites. In a secret CIA assessment submitted to Truman on Aug. 13, 1947, U.S. Military Governor Gen. Lucius D. Clay reported that anti-Semitism was growing very sharply among the ranks of the U.S. military units in the American zones of Austria and Germany because of the violent, asocial and criminal behavior of the eastern European DPs, all of whom were Jewish. He recommended that these DPs be allowed to enter Palestine before some incident occurred with American soldiers — who had been beaten, robbed and killed by Jewish DPs — that could lead to severe spontaneous reactions on the part of other soldiers. His views were strongly seconded by Deputy British Military Gov. Sir Brian Robertson. Meanwhile, on Aug. 5, 1947, in England, anti-Semitic outbreaks resulted in five days of rock throwing, window-smashing and other incidents, including daubing Jewish businesses with swastikas and numerous assaults on British Jews. These incidents occurred in Liverpool, Manchester, Cardiff (Wales), Leeds, London and Birmingham as retaliation for the murder by Jewish gangs of two British sergeants in Palestine, and Menachem Begin’s, Irgun bombing of the King David Hotel in Jerusalem on July 22, 1946 in which 91 persons were killed. 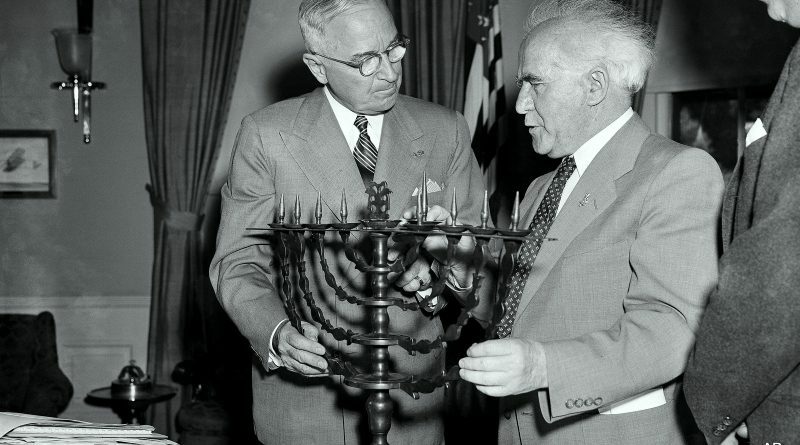 Soon afterward, Truman agreed to the partition of Palestine. However, this resulted in a rebellion within the State Department. In a note written on March, 1948, Truman complained that “The State Dept. pulled the rug from under me” in a statement contrary to his own policy on the Palestine question. Truman assured Chaim Weizmann, the Zionist leader, that the U.S. backed the idea of partitioning Palestine between the Arabs and the Jews. But the following day, Ambassador Warren Austin made a statement to the contrary at the United Nations — which occasioned Truman’s bitter remark about the State Department. In 1991, pro-Zionist Defense Secretary Clark Clifford described the hardball lobbying for the original partition. Partition was adopted only after ruthless arm twisting by the U.S. government and by 26 pro-Zionist U.S. senators; who, in telegrams to a number of U.N. member states, warned that U.S. goodwill in rebuilding their World War II-devastated economies might depend on a favorable vote for partition. On March 5, 1948 the Jewish Agency stated that large-scale Jewish arms shipments were ready in various Mediterranean ports destined for the arming of Jewish partisans in Palestine to “fight and drive out” the Arab population of what the Agency stated “was eternal Jewish land” that could not be occupied by either the British or the Arabs. On April 9, 1948 , in Jerusalem – Irgun and Stern gang terrorists stormed an Arab suburb, Dir Yashin, killing 250 Arabs, half of them women and children. It’s uncertain whether it’s factual or just more lies, but it has been said that a transcript of a conversation between Undersecretary of State Robert A. Lovett and World Jewish Congress co-founder Nahum Goldmann was found in Goldmann’s papers in the Central Zionist Archives in Jerusalem. Lovett reportedly said, “Anti-Semitism is mounting in an unprecedented way in groups and circles which are very influential and were never touched by Anti-Semitism. Such a White Paper would do great harm to the Jews in this country, and once it is published, I am not sure that outstanding Jewish leaders who are helping you today would go along with you.” This White Paper focused on dual loyalty. After Israel became a fait accompli in 1948, the counteroffensive ended. America Firsters George Marshall left his position and James Forrestal was murdered, and both the Pentagon and the State Department earnestly embraced Israel. The Arabists in State were quickly reduced and co-opted by pro-Zionists. The burgeoning Zionist lobby continued to flex its muscle within the Democratic Party.